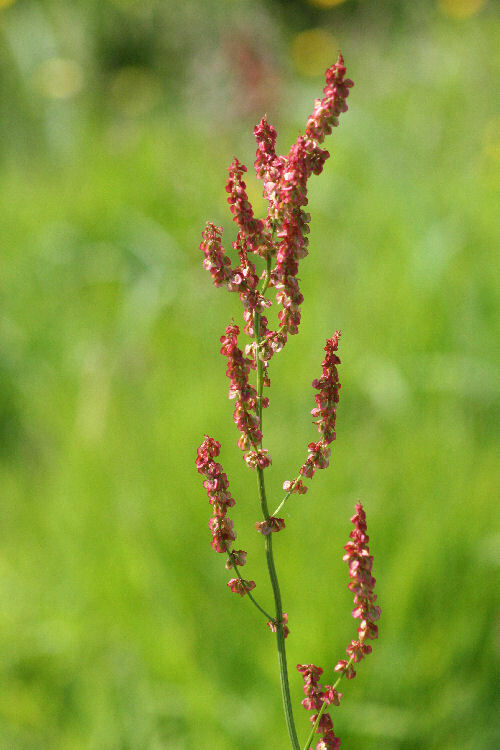 Common Sorrel Rumex acetosa. 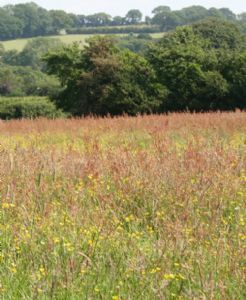 Similar looking, but a more delicate plant than Dock, with fine, long flower heads of red that rise up to glow across the wildflower meadow taking over from the buttercups and before many of the grasses flower. It is the larval foodplant of the Small Copper butterfly and attracts many other insects that provide food for birds, especially Spotted Flycatcher, Songthrush, Starling and House sparrow, as well as seed later for Sparrows and finches. The leaves also make a lovely delicate lemony flavoured herb and are one of the ingredients of 'Green Sauce' recipe in this section - another great recipe is sorrel and lettuce soup; keep cutting and don't allow it to flower if you want to use it as a herb.